The British Telecom Communication Tower in London's West End was the first purpose-built tower to transmit high frequency radio waves, and it serves as a functional telecommunications centre designed to relay broadcast, Internet and telephone information around the world. 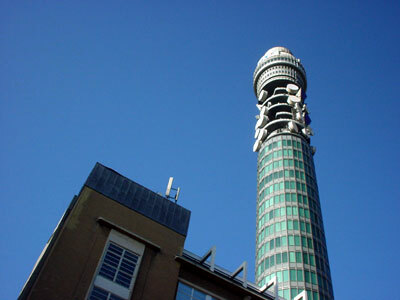 Built to cater for the UK's growing telecommunications requirements, Telecom Tower was designed by a team led by G R Yeats under the direction of Eric Bedford, chief architect of the Ministry of Public Buildings and Works. The principal building contractors were Peter Lind & Co.
Costing £2 million to construct, the 189m (620ft) cylindrical tall tower is made from 13,000 tonnes of concrete, steel and glass, and at the time of opening was the tallest building in London. It's shape was designed to reduce wind resistance and gave it stability and style. The tower was to become the crucial artery in Britain's new microwave telecommunications network, which planners fondly imagined might survive a nuclear exchange, and so enable our PM to plaintively ring other world leaders from an enormous bunker in Wiltshire. They are mostly circular because the designers noted that the only buildings that survived in Hiroshima and Nagasaki were round, with the shape allowing the enormous blast wave to surge round them. The Telecom Tower's impressive height (it remained the tallest building in London until the NatWest Tower in 1981) ensured that it could beam calls over the Chiltern hills that form the north rim of the London basin. Work on the tower started in 1961, with the then Prime Minister, Harold Wilson, officially opening the 'Post Office Tower' on October 8th, 1965 with a ceremonial call to the Lord Mayor of Birmingham. 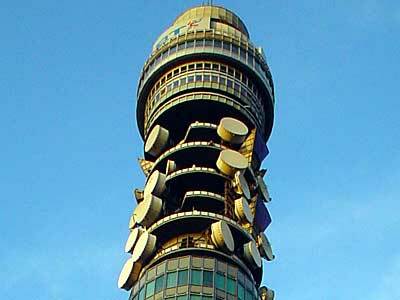 (The tower is now known as the 'BT Tower' or 'British Telecom Tower'). Bizarrely, Sir Billy Butlin and Tony Benn joined together on May 19 1966 to open the 'Top of the Tower' restaurant. The tower was an immediate hit with the public, attracting 1.5 million visitors in the first year. The first 16 floors of the tower are utility platforms dedicated to radio, ventilation, refrigeration and power units. Above the 16 utility floors is a 35-metre open section stuffed full of microwave antennae, aerials and dishes providing telecommunications transmissions carrying TV, voice and data via microwave radio. Close up of the microwave antennae, aerials and dishes. Note the 'BT' logo. Above this telecommunications sector are 6 further floors housing the Presentation and Function Suites, kitchens and more technical facilities. Above that are the lift motors and water tanks and crowning it all is a 40-feet high London Weather Centre radar mast. The 34th floor used to host a Butlins-leased restaurant, built on a 3-metre wide revolving segment which spins through 360º every 22 mins (a speed of 0.17 km/h). In the early hours of October 31, 1971, a bomb exploded on the 31st floor (curiously, no one ever claimed claimed responsibility for hiding the device). No-one was injured in the blast but the physical damage took two years to repair. 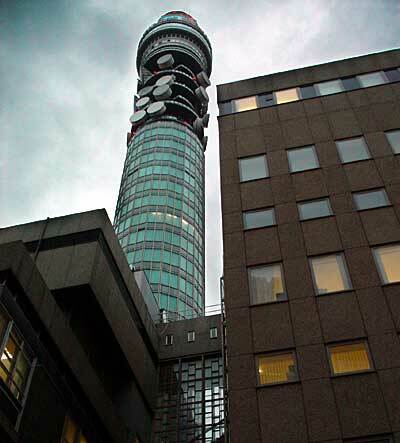 BT decided public access to all areas was no longer viable and the restaurant closed in 1980 (by this time, more than 4.5 million people had visited the BT Tower). 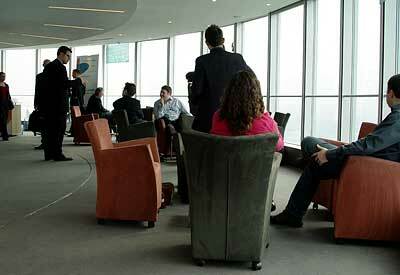 The revolving restaurant at the top of the BT Tower has exclusively been used for corporate events in recent years, with the likes of Joe Public kept firmly at bay. In November 2009, BT announced that it will be reopened for the first time in nearly 30 years. In December 2010, BT quietly announced that the plans had been abandoned. 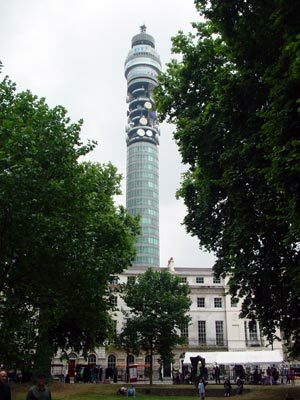 Telecom Tower from Fitzroy Square. Entry to the building is provided exclusively by two internal high-speed lifts that travel at six metres a second (22 km/h), taking 30 seconds to reach the top, making Telecom Tower the only building in the country which is allowed to be evacuated by lift (an oddity which required Parliamentary legislation to be passed). Curious fact! Despite the BT Tower being one of most recognisable and conspicuous buildings in London, it was classed as an 'official secret' until fairly recently, and taking or possessing photos of the BT/Post Office Tower was technically an offence under the Official Secrets Act! This rather begs the question: why wasn't Noel Edmonds locked up for broadcasting live Christmas Day programmes there in the seventies?! Location: 60 Cleveland Street, London W1. See map location.